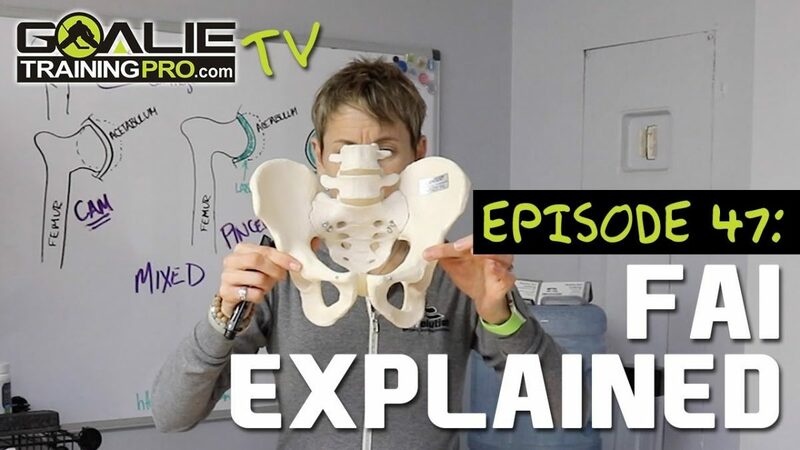 Today we are talking about FIA (hip impingement) for episode 47 of Goalie Training Pro TV. Okay, so you know I’ve been working on the big article on FAI, impingement in hockey goalies for a couple of months now, and it’s finished. The draft is finished, but I wanted to just walk through what FAI is, what impingement is, what does it mean, what’s actually going on in your body. That’s what we’re covering today. I’ve drawn these pictures on a board and it’s basically … You have your femur and then the head of your femur, which sort of is almost like a ball on the end. And then there is the socket of your hip joint. Really, if you visualize this, I tried to draw a circle (in the video) to show that that ball kinda goes into your hip joint. And your pelvis is the socket and the ball of your femurs fits in that socket. And then that socket is called the Acetabulum. It’s the head of the femur and the Acetabulum, that’s what makes up your hip joint. When you get an impingement, there are two, well kind of three types of impingement. The first is a CAM impingement. So what happens is, for whatever reason, because of activity, because of just the way you’re put together, not everybody has a perfectly shaped ball and a perfectly shaped socket, some of them are a little bit misshapen. And then to add on to that, you decided to be a hockey goalie and you’re doing things like hip flexion, adduction, internal rotation, which is like impingement position. It’s a position they put you in if they wanna test if you have impingement. And so if the edge part of the ball rubs on the lip of the socket, it by nature and how our body adapts, it sort of gets build up a bony callus. It will build up more of a bony callus and more of a bony callus over time, so it creates less space, it decreases your range of motion more and it gives you probably more discomfort over time. So that is called a CAM impingement and it happens on the femur side, on the head of the femur. The other kind is called a pincer impingement, and it’s when … Maybe the rim of the socket is a little misshapen and it encroaches a little bit. So then again, the head of your femur butts into that, so it’s makes a bony callus and again the result is the same, less range of motion, more pain, more dysfunction. That is called a pincer impingement. Then you can kind of have like a little mixture of both of a CAM and a pincer. Doesn’t super matter what kind it is, the result’s the same. If it gets bad enough that you can’t play because of the pain, they’re gonna have to either go in there and trim it up so that you’re not smashing bone on bone. The other thing I want you to learn from this and take from this is that, “Well what’s that labrum?” A lot of times when surgeons go in or when goalies have a hip impingement, they also have a torn labrum. Well the labrum is sort of almost like a cartilaginous ring. If I’m looking at the socket straight on, so we’re looking right at the socket and there’s this ring of cartilage type material, and that is the labrum. It does a couple of things, and it’s just the ring around that rim. It gives the joint a little bit more depth, it almost makes a little suction seal to make the joint more stable and it provides a little bit of shock absorption, a little bit of a bumper cushion there for you. But it can get torn, it can get pinched as well. Again, then you’re gonna have sort of grabbing pain or even a locking in your hip, and they’ll have to go in and sort of trim that up and make it all nice again, or repair it. That’s what the labrum is. Then you also have articular cartilage on the surface of both the socket and the head of the femur. It’s just kind of like … It’s almost a bit like synthetic ice. It’s smooth, it’s kind of glassy and it helps the two bones rub against each other almost frictionless, so it’s not bone on bone. When you get, like osteoarthritis and that kind of thing, that gets worn away and gets degenerated and that creates problems. In a really bad osteoarthritic hip, that cartilage will be so worn out that they’ll say you have how bone on bone OA. It just means your bones are rubbing on each other, which is not ideal. So that’s what the cartilage is too. Again, it can get damaged if there’s an impingement. Ladies and gentlemen… that is what you need to know about hip impingement. I got nothing else. If you liked this post/video, subscribe, hit like, hit the bell. I’m not trying to scare you, but it is something pretty serious. On that note, see ya.